Her much-discussed profile contains attacks on her family life that make even some liberals cringe. It’s just about the lamest card in the pack of criticisms leveled at powerful women: you must be a Bad Mother. Just when you think we’ve accepted that a woman can have a job and still love her children, along comes another piece of reporting to remind us that some people still think it’s fair to judge a female public figure on the basis of what kind of parent—and wife—she is. This is something male politicians, who have long perfected the role of absent father, deal with very, very rarely. Hardly a novel approach for a politician wooing an audience. Yet the piece goes on to count the ways in which Palin is a neglectful and selfish parent, and an abusive spouse. Imagine, politicians who let their spouses pick up the slack on the home front and encourage their kids to campaign with them. Who doesn’t? When will women stop being made to feeling guilty about this? This is why feminists immediately rolled their eyes—and several, who despise Palin’s politics, grudgingly protested. Yet, while this may make many of us frustrated and angry with a persistent sexism in the media, it is not likely to soften people’s attitudes to Palin for long. Just as attacks on her credibility and intelligence are unlikely to sway her supporters, so sexist attacks on her parenting—or even snipes at her appearance (including an odd claim from a “friend” that she wore a push-up bra to a meeting “so I can get what I want tonight”)—are unlikely to shift her detractors. People tend to be far more tolerant of sexism—or, sometimes, entirely blind to it—when they dislike the woman it is leveled at, as Hillary Clinton experienced. Obviously, all politicians have flaws—gender bias is usually evident in how much weight we give those flaws, how worthy of dissecting we consider them to be, and for how long we think it pertinent to be discussing them. But in this case, it is a problem that Palin’s parenting is considered a flaw at all. While all politicians are vulnerable to personal attacks, some attacks are particularly shameful. So what is the substance of these allegations? First, Palin may have something representing a modern marriage, which has prompted some locals to speculate that Todd may be “henpecked.” Fancy that charge being leveled at the husband of a woman with opinions. It’s striking that while the husbands of successful women are frequently portrayed as emasculated by their wives’ success, the women who marry powerful men are usually seen to benefit from their greater status. Second, Palin’s work has affected her closeness to her kids: we are told that “at least since the start of the 2008 campaign, Todd has been shouldering the bulk of the parenting and that Sarah’s relationship with her children has grown more distant.” And yet a few sentences later we also learn that when she grew lonely on the campaign trail, Palin wanted her kids to travel with her because she “seemed comforted” by having them around. But instead of empathizing—who wouldn’t hate to be separated from their kids?—the implication is that she is selfish: the kids came, but not much homework was done. What choice would you make? The third allegation is that she was a sloppy parent when her kids traveled with her, and she failed to discipline them adequately, at least in the eyes of some observers: “On the road, aides say, Sarah spared the rod.” She reportedly demanded one child use the pink and purple Sharpies the youngster wanted to sign autographs with (not the black one that was provided) and insisted another have hair and makeup done by a campaign stylist. She was hardly being cruel; it’s stupid to judge such trivial incidents without context. And on it goes. We also learn Palin used campaign money to buy “many Spanx girdles,” that she has a bad temper, was mad when she and John McCain lost the election, is a bad tipper, and lied about the fact that she went hunting and fishing: she even cooked mooseburgers for a Fox journalist with meat from a moose someone else killed. There are some very interesting points in this article, most notably about Palin’s funds, hints of her future plans, and the character of her closest advisers. It is a shame these insights were clouded by factual errors; (about whether Trig was present at the speech the article opened with, for example) and nasty insinuations about her children. It has always been assumed that the families of male politicians sacrifice; the families of women politicians suffer. In some quarters, these beliefs linger and, seemingly, refuse to fade. It can only be a good thing for everyone if we hear a lot less about these kids, thrust under intense, often unpleasant and, doubtless, hurtful, theater lights while they are still growing. And as for their mother—let’s stick to a desperately needed scrutiny of her inflammatory politics and steer clear of this kind of rubbish. Posted in Newsweek, U.S. 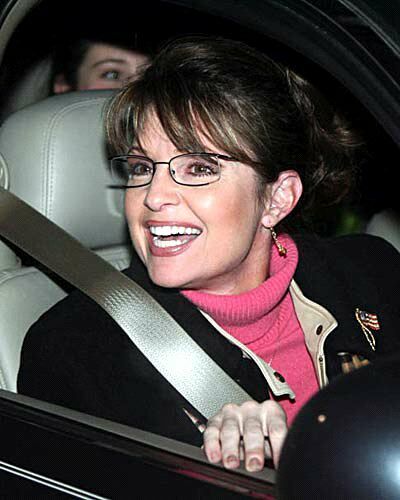 Politics and tagged Feminism, Sarah Palin. Bookmark the permalink.